One of the most important yet most overlooked tools of modern journalists is the ability to aggregate, synthesize, and organize coherent conclusions and logical predictions from the massive numbers of news stories available to media consumers today. In short, to aggregate the news into something easily digestible for the modern news consumer. Which is a great deal more difficult to do ethically and correctly than it appears. Sadly, many sources online that aggregate news unethically turn it into propaganda - effectively diluting the value of both the source and the stories that source chooses to feature. Another common failure of news aggregation is the "emotion wash" - a failure of many news organizations today. The goal of "emotion washed" news is to make the news as inoffensive as possible, so as not to offend, disturb, or scare off advertisers. The side effect of such ignorant management however, tends to create uninterested, dispassionate news consumers with less brand loyalty, and has led to a dangerous level of distrust for any news organization - which explains in part the decrease in both online and offline newspaper subscribers. Shawn's experience as a high-quality news aggregator proves that he is neither a propaganda monger or someone willing to "emotion wash" the news. 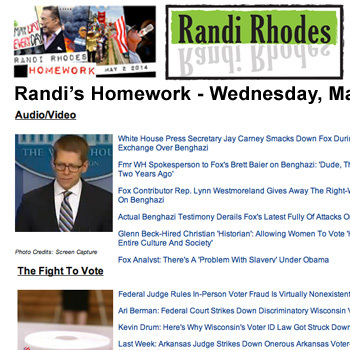 For most of four years, Shawn acted as the primary news aggregator for The Randi Rhodes Show. This involved creating, distilling, organizing, and publishing the "Homework" for the show each weekday from 60-80 links gathered by himself and the other staff members of the show. Near the end of the run of "The Randi Rhodes Show", Shawn even sat down with guest host Nicole Sandler, took fifteen minutes, and taught the listeners how Shawn aggregated the news daily - and how they could do the same thing themselves. Overlapping with his time at "The Randi Rhodes Show," Shawn also was the primary news aggregator for "The Daily Felltoon" newsletter, a weekday online and e-mailed newsletter from 2009 to 2014. 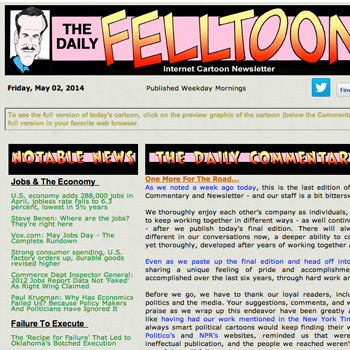 "The Daily Felltoon" was subscribed to by some of Washington, DC's most influential lobbyists, along with selected members and staff of Congress, the White House, and members of the national media in print, online, radio, and cable television. 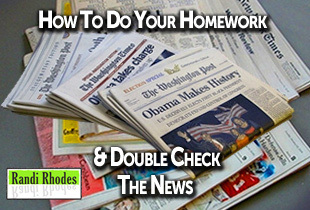 Examples of Shawn's news aggregation abilities for both "The Daily Felltoon" and "The Randi Rhodes Show" are included below. News Aggregation Example From "The Daily Felltoon"
News Aggregation Example From "RandiRhodes.com"